Enjoy this beautiful tour to discover Capri, Sorrento and Pompeii just in a day and spend your time to visit Blue Grotto, Pompeii Ruins, Via Camerelle and other places to live a wonderful experience! If you think it is impossible to visit three important place in a day, you are wrong! 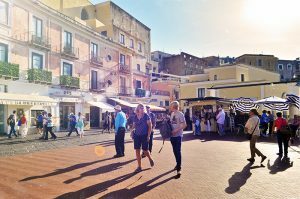 This private tour will cover the most charming places of Naples. You will find your local English-speaking guide at the port of Naples to take one hour jetfoil ride to Capri. Capri is located in the Tyrrhenian Sea off the Sorrentine Peninsula, on the south side of the Gulf of Naples in the Campania region of Italy. It is famous for its caves and it is chosen by vip, kings and politicians from all over the world for their holidays. At your arrival at Marina Grande, main port of the island, you will take a convertible car that will lead you to the Mamma Mia road. This road takes name from the astonishment you will express once you drive on it. It is carved into the mountain overlooking the sea and its view is breathtaking. 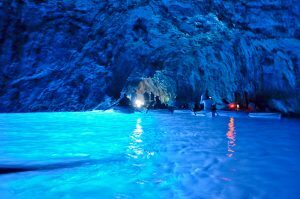 Next stop will be the famous Blue Grotto and, to enter it, you have to lie down on the bottom of a rowing boat that slides through the small arch. In the cave you will enjoy the silence, the darkness and the sparkling blue water and it will seem to you to be in a magical world. After that you will visit Via Camerelle and La Piazzetta, and then will leave Capri by jetfoil to reach Sorrento. There you will have a walking tour through the narrow alleys of this ancient city and lunch in a local restaurant enjoying the typical food. 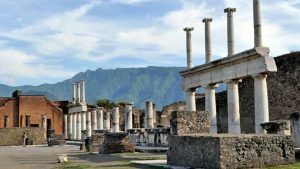 At the end you will take a private coach to reach Pompeii to discover Pompeii Ruins. There an expert private guide will show you the ruins, visiting the Domus and the Anfiteatro, the Forum and thermal bath. A very dive into the past where you will learn the history and curiosities about the ancient city buried under the lava of the Vesuvius explosion more than 2000 years ago! Finally you will go back to Naples with your driver and guide, keeping in your heart and in your mind the memory of a special day!